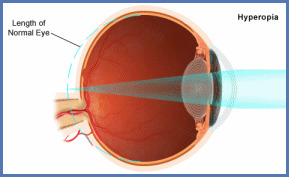 Myopia occurs when the eyeball is too long or the cornea is too steep. When rays of light enter a myopic (long) eyeball, they are focused in front of the retina instead of directly on the retina where light must be directed for normal vision. 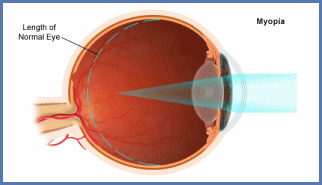 Symptoms of nearsightedness can include eyestrain, blurred vision or headaches. Myopia or nearsightedness requires a concave corrective lens (glasses or contact lenses), which is written as a 'negative number' in your prescription. Surgically, nearsightedness is corrected by flattening the central cornea or implanting a contact lens (ICL) or intraocular lens (IOL).